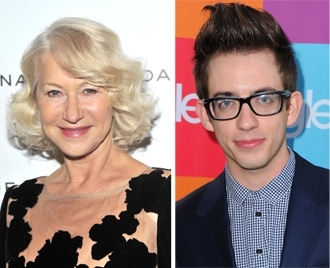 Get ready to see Helen Mirren guest star on an upcoming episode and of Glee! Helen dished to OK! on the red carpet last night of the National Board of Review Awards Gala in NYC about her love of the show and favorite member of the Glee cast. Helen revealed to reporters that she’s already taped her appearance on the show. Helen didn’t want to play favorites with the cast, but she ended up doing it anyways! So what does Helen love so much about Kevin McHale (aka “the guy in the wheelchair”)? “And he’s a great dancer! You know, there’s this great dancer who has to spend his life in the wheel chair…” she explained of his moving character.